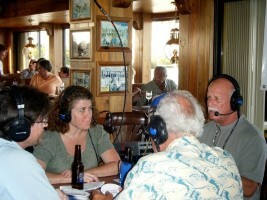 Michelle Owen, EDF’s Recreational Fisheries Specialist, shares her first experience appearing on the Captain Bill Kelly Friday Night Radio Show in the Florida Keys. What was scheduled as a 30 minute meeting on April 17th with Captain Bill Kelly turned into 90 minutes as he persuaded me to be a guest on his Friday night radio show. The show is great community radio broadcasted live every Friday night from Wahoo’s Bar and Restaurant at the Whale Harbor Marina in Islamorada. Yes, my meeting was scheduled in a bar, it’s the Keys! And it’s the perfect spot for a productive meeting – a great view of the charterboat fishing fleet, fresh fish and a great crowd. Not too surprising that a fishing show packs the bar every Friday night. It was my first time on the radio and Capt. Kelly and his co-host did an excellent job keeping it easy and fun. Capt. Kelly introduced me to his listening audience and encouraged recreational fisherman in the Keys to contact me to learn more about EDF’s fisheries work. I have a standing invitation to come back for a more lengthy topical conversation and I plan on taking him up on that offer sooner rather than later. Though I can’t promise a view, I’ll let you know when you should fire up the grill, pour a cold drink and listen live via internet to EDF talk fish on the “Friday Night Radio Show”.